Our instructors lead classes in the traditional practices of hatha yoga, as well as provide a variety of therapeutic yoga techniques. Adaptive yoga, kids' yoga, yoga for special needs, trauma-sensitive yoga, yoga for recovery and Yoga Therapy are all modalities represented among our instructors. Get to know the teachers at 5KY. Rita has been practicing yoga since 2004. She completed her 200-hour teacher training with Rhonda Kantor, founder and director of The Global Yoga Center. Rita is also trained in the Yoga for the Special Child method by its founder, Sonia Sumar. ​Rita's career serving children and adults with special needs spans twenty years. She offered small group classes for students in a residential setting, as well as "care for the caregiver" practices for staff. 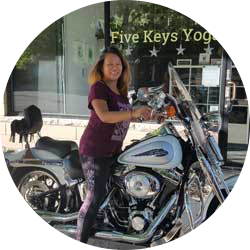 Rita integrated her yoga training with her special needs experience to create a practice specific to the residents' needs. She brings a spirit of inclusion to her classes and can gently adapt a practice to each student's needs. Yoga became a way for her residents to connect to their abilities, their gifts, and their light. Rita believes in yoga as self-care - as a loving way to replenish energy and connect to your spirit. She finds it an enjoyable way to quiet the mind and find peace amidst our busy lives. She teaches all her students the simple beauty of slowing down and honoring our bodies. ​Jennie devotes her time to inspiring, motivating, and journeying with others, in their process of clearing out clutter in the mind, seeing past obstructions, and into their true beauty and light within. Inspired by music, art, and creative expression, Jennie believes that yoga is an individual path to a life lived fearlessly, free of bias, judgment, and the “one size fits all” mentality. To be courageous! To be yourself. In addition, Jennie is a certified Learning and Behavior Specialist (LBS1) who previously taught as a Special Education Teacher. 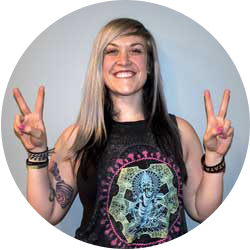 With her educational background and training in YSC, Jennie is well-equipped to provide yoga services accommodated to each student’s individual needs. Once structure is established, it allows for the ignition of true expression and freedom. In adult classes, Jennie creates an opening and inspiring space to feel peace and connectedness with one's inner child. Jennie is a certified yoga teacher at the 200 hour level and is RYT-200, in addition to her certification in the Yoga for the Special Child method. The Yoga Therapy components of Jennie's instruction are based on the Yoga for the Special Child method, not derived from her status as an RYT® with Yoga Alliance Registry. Over 8 years ago, my mom introduced me to my first yoga class and immediately I was entranced by the idea of a practice to help quiet my mind, tune into the present moment, and solely focus on the rise and fall of my breath. Since then, yoga has been my dearest outlet for releasing any turbulent emotions while bringing abundance to the joy that is all around us. This breath to movement meditation practice undeniably started changing my life in a refreshingly positive light and so naturally, each and every day allowed me the space both physically and mentally to move and grow on my mat from the inside out. After graduating from UW-Milwaukee last May with a Bachelors Degree in Occupational Therapy and Psychology, while also obtaining my certificate in Therapeutic Recreation, I followed my path towards deepening this understanding that our bodies are the home our spirits have on this earth, and we should innately be doing everything in our power to take care of this home that is our own. Recreational therapy set the idea in my life that in order to stay healthy on every domain, we must do something every day that we enjoy for the sole purpose of our well-being; which is a concept I aim to spread. So, I headed across the globe in September to the sacred birthplace of yoga, Rishikesh, India, and completed my 200-hour Yoga Teacher Training to further connect into my personal practice and teaching capabilities. Now I’m here to spread knowledge far beyond our physical asanas, share our universal energy, and help expand the practice of any yogi seeking to balance the body, mind, and soul. Give yourself the belief that the best possible outcome will happen. Erin first found yoga while attending Northwestern University. It was love at first pose! 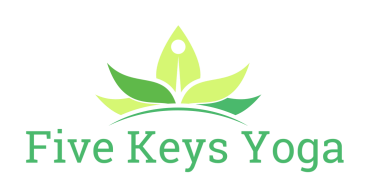 She loves yoga for the relaxation and well being she feels after each session and for the self-confidence she has developed through her own practice. The gift of peace she receives from yoga is what keeps her coming back and what she hopes to give to her students. Erin is passionate about bringing yoga to those who experience barriers to their practice – including physical, intellectual, emotional, financial or geographical. Peace is accessible to all! Her work has taken her to numerous Chicago-area schools, health centers, and medical clinics; including Trilogy, Inc., Chicago Public Schools: Wilma Rudolph Learning Center, Jahn Elementary, and William Brown Elementary, Camelot School Mt. Prospect, and the Discovery Clinic. 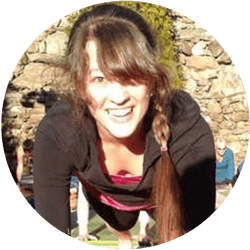 Erin is a certified Yoga Therapist (C-IAYT) with the International Association of Yoga Therapists and is registered as E-RYT 500, RCYT, and YACEP with Yoga Alliance. She completed her yoga teacher training with the creator of the Yoga for the Special Child® (YSC) method, Sonia Sumar, and has taught the YSC method since 2010. She is a certified Stress Management Specialist, and also holds certifications in Adaptive Yoga, the YSC method, and Yoga for Teens. She pursues continuing education in Yoga Therapy with YSC and at the Integral Yoga Institute. 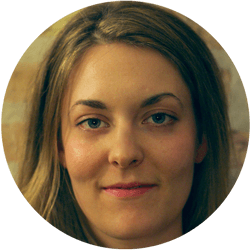 Erin is a member of the Integral Yoga Teachers Association. Lily Peifer took her first yoga class at age 13 and never wanted to stop. Lily loves the way that yoga helps her get out of her head so that she can think more clearly. She continues to use yoga to help others connect with their own inner strength and wisdom, which are too often smothered by anxieties, perfectionism and self-judgments. Lily strives to learn something new each time she practices yoga, facing the world and herself with gentle curiosity. Lily's teaching style incorporates a balance of playfulness and steadiness. She was trained in both Iyengar and Vinyasa Yoga. She earned her 200-hour certification through the Asheville Yoga Center in 2011. Lily is also a Licensed Clinical Social Worker working in the field of mental health, and is currently working towards her Yoga Therapy certification. As a dancer, performer, artist, musician, bicyclist and teacher, I am constantly striving to find harmony between strength and flexibility and knowledge and learning. My inspiration comes from all art forms. I have been a student of yoga since the late 90's. As someone with deep compassion and an ability to connect with others, yoga is the perfect outlet for me to explore this further. I am passionate about the ability to use yoga for healing and for special needs. Yoga provides the opportunity to always bring lightness and humor, along with connecting with oneself on a deeper level. I strongly regard that yoga is for all beings. I bring much experience and knowledge to my classes and always aim to create a safe and nurturing environment for each of my students. I have attended trainings/certifications for Pre and Post Natal Yoga, Gentle Yoga, Yoga and Osteoporosis, Prison Yoga, Aqua Kriya Yoga, Children's Yoga, Accessible Yoga, Healing Relationships, Trauma Informed Yoga and Yoga for Stress, Anxiety and PTSD. I am currently beginning my second year of studies to become a yoga therapist. I committed to assisting classes with Gabriel Halpern to work one on one with students with sports injuries, disabilities, chronic conditions and physical and medical challenges, which was a valuable part of my yoga training. I believe yoga can provide a balance to the physical and emotional stresses of our environment and I am committed to inspiring others, as I have been inspired, by this practice of mind, body and spirit. I am grateful to my many teachers including Steve Nakon, Tracy Pristas, Rhonda Kantor, Rita Knorr, Dorie Silverman, Nischala Joy Devi, Maria Mendola, Chinamasta Stiles, among others.